November 30, 2016  Before the election, two prominent economists were predicting that the stock market would fall 12 percent lower if Trump won versus Clinton. But, as it often does, the market surprised everybody and went in the other direction. 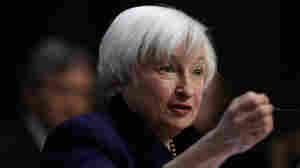 November 17, 2016  Janet Yellen warned Congress Thursday the timing might not be right for infrastructure spending and questioned Donald Trump's assertions that the Dodd-Frank stock market rules stifle economic growth. 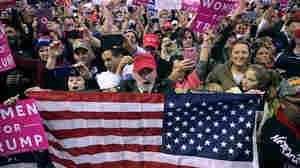 America's 'Forgotten' Hear Trump's Economic Battle Cry, But Will He Deliver? November 16, 2016  We're about to find out whether Donald Trump governs as a populist champion or as a more traditional Republican when it comes to the economy — or a new mix of both. November 9, 2016  In his acceptance speech, Trump pledges investments for U.S. infrastructure, adding a little specificity to his vague campaign promises. Skittish business leaders will watch who he puts on his team. 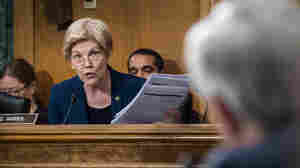 November 4, 2016  Elizabeth Warren and two other senators are asking the bank about reports of retribution against would-be whistleblowers. The senators cite NPR reports about workers who were fired or pushed to quit. November 3, 2016  With less than a week to go to voting day for the presidential election, and the race between Donald Trump and Hillary Clinton tightening, financial markets are starting to get the jitters. With the election almost upon us, the stock market is paying close attention — and that's unusual. Markets don't usually move too much based on who wins the presidency. 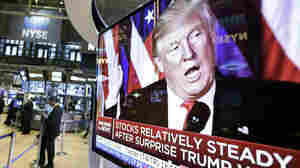 But this time around it's a different story, and as Donald Trump's prospects have improved, stocks have been falling. October 14, 2016  Wells Fargo's CEO has said the banking scandal was the the fault of some bad apples at the company who have been fired. But former workers are now speaking out and telling NPR they were "good apples," and they were fired, too. Some were fired after calling the company's ethics line repeatedly to complain about the gaming and fraud and oppressive sales culture at the company. And some say being fired by Wells Fargo a few years ago has badly damaged their careers ever since. October 12, 2016  Wells Fargo CEO John Stumpf is retiring, effective immediately, in wake of the scandal over the bank's sales practices. Stumpf has been under fire since federal regulators fined the bank $185 million. September 29, 2016  Wells Fargo CEO John Stumpf goes before the House Financial Services Committee on Thursday to further respond to questions about the misuse of customer accounts. 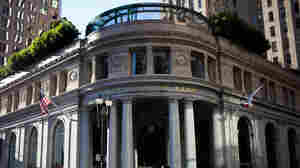 Former employees are suing the bank. September 9, 2016  Wells Fargo Bank is to pay $185 million in penalties after thousands of workers were found to have earned bonuses by illegally creating accounts for customers without their knowledge. 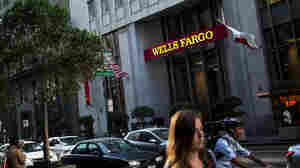 September 8, 2016  Wells Fargo will pay $185 million in penalties following accusations the bank opened deposit accounts and credit cards for customers without their permission. The Consumer Financial Protection Bureau says bank employees opened more than 2 million accounts that may not have been authorized. The motive, according to regulator, was to hit sales targets and compensation incentives. August 30, 2016  It's been almost a decade since the worse housing crash since the Great Depression. And while the housing market has healed in some ways, in others it's far from normal. Single family home construction is rebounding from the trough, but still far below historical norms and the homeownership rate just keeps falling.